This afternoon I was doing some cataloging of images when I came across a folder from a few years back. 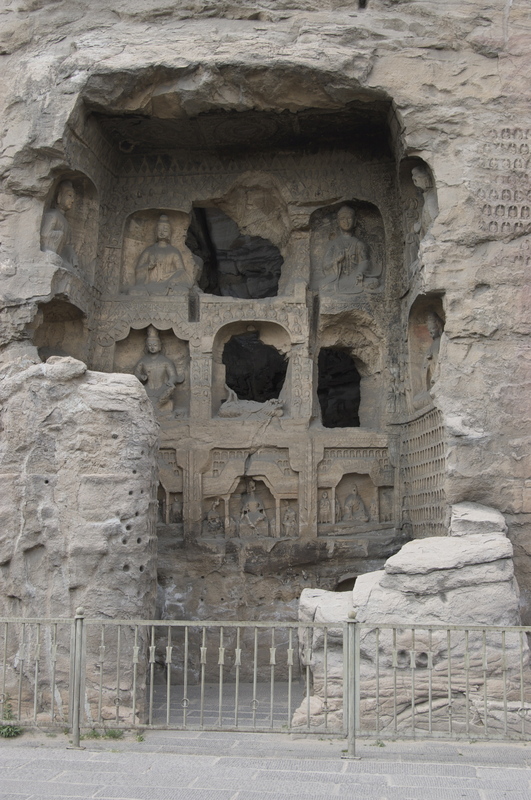 In it I found a few photos from the Yungang Grottoes—a collection of ancient carved buddhist grottoes just outside the city of Datong in Northern China. Every year that I take student groups to China we visit the grottoes, not because they are old or buddhist, but because they are just down the valley from the coal mine that we tour and a stop at the grottoes makes for a nice break before we head back into the city. The grottoes are from the 5th and 6th century and are listed as a UNESCO World Heritage Site. The twentieth century was, however, pretty rough on them. Typically tourists to religious sites like the grottoes hear how Red Guards seeking to destroy “four olds” during the Cultural Revolution have damaged them—defacing statues and destroying ancient inscriptions. In the case of Yungang, however, the most obvious missing pieces were not the result of utopian revolutionary zeal but for their value as “art”—collected by foreigners who had them crudely hacked from the rock face and carted off. Every year my class can see the empty spaces where the transnational value of objects-as-art in Western eyes was victorious over the local value of religious meanings. I learned on my second trip to Yungang that the collected pieces were on display as part of the collection of the Metropolitan Museum of Art in New York, so a few years ago when I went to New York I sought them out among the Chinese sculpture on display and took some photos. Those photos were in the folder that I found this afternoon with my image from Yungang. 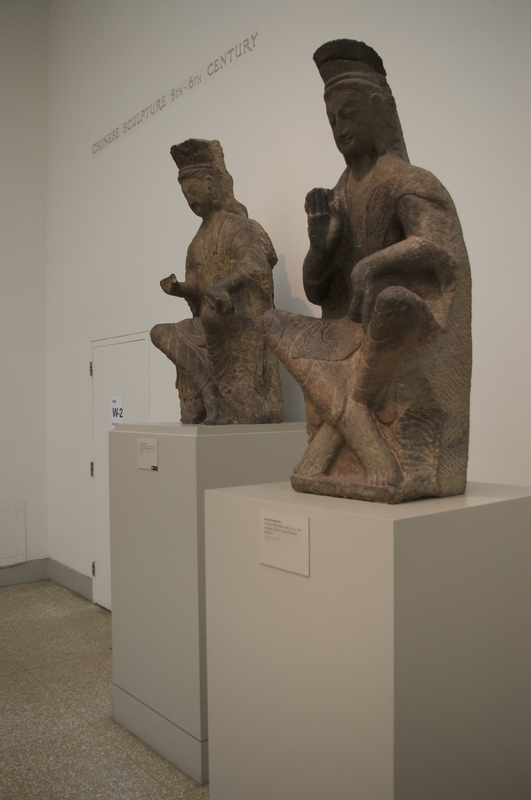 Interestingly the photos show a display at the Met that is the inverse of the grottoes in China. Fifth century walls with empty twentieth century holes. Fifth century pieces with empty twentieth century walls. The logic of museum representation is plainly visible. I took the photos with the intention of perhaps Photoshopping them into the grottoes at some point. I also thought it would be nice to send prints of the pieces to my tour guide friend in Datong. If I were an artist I’d do a piece of performance art and go to Datong with a digital projector and project the images of the statues into the spaces in the walls. Of course, they aren’t really “statutes” at all. They were made into statues by the act of their removal from Yungang—where they had been carved into the ancient rock face. 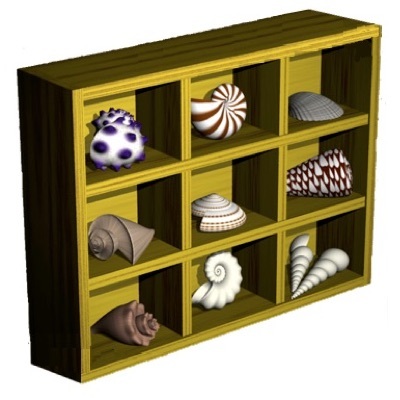 They are literally “pieces of art”—pieces made into art by their fracturing and collection. Seeing the photos of the two contexts and thinking about their differences it strikes me how what looks like sublime “oriental” art in New York looks like simple vandalism in China.